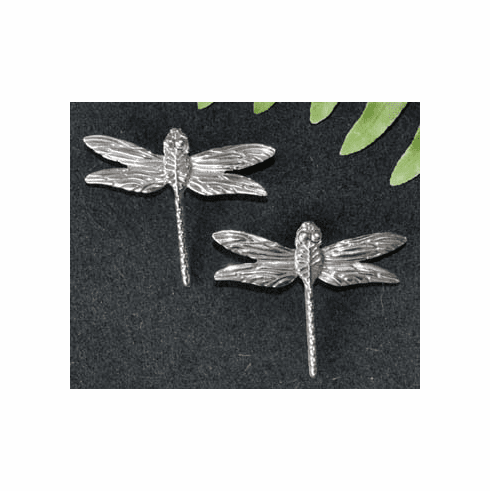 Sterling Silver Dragonfly Post Earrings - Handcrafted with quality by the same artists that create our Dragonfly Pendants [above], our solid Sterling Silver Dragonfly Earrings are available either mounted on posts or on hooks. So detailed the post mounted dragonflies appear to have landed on your ears lobes or mounted on shepherds hooks they dangle creating enchanting movement. They are equally wearable with jeans or for a formal evening out. Earrings measure 1-1/4" in length with a 1-1/2" wingspan. Gift Boxed.